It’s Speedy Tuesday! 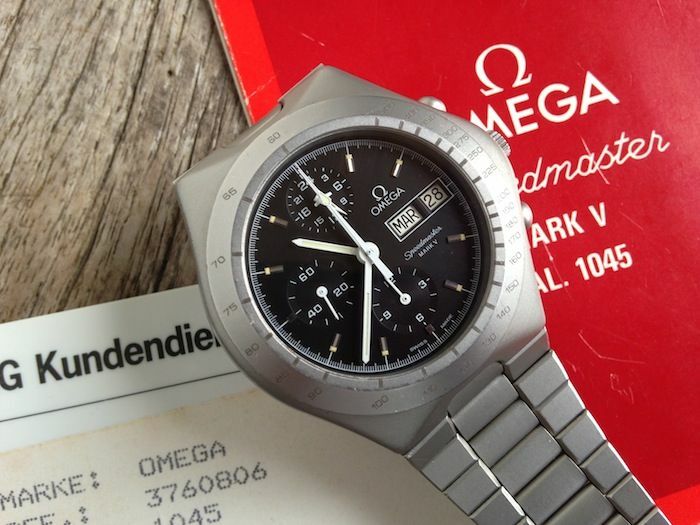 Today we have something quite special, an OMEGA Speedmaster Mark V from 1984. OMEGA introduced the Speedmaster Mark series in 1969 with the Mark II and it lasted till the Mark V (1984). The OMEGA Speedmaster Professional (either 145.022 or – as we know it now – 3570.50) was always available as well during these 25 years. 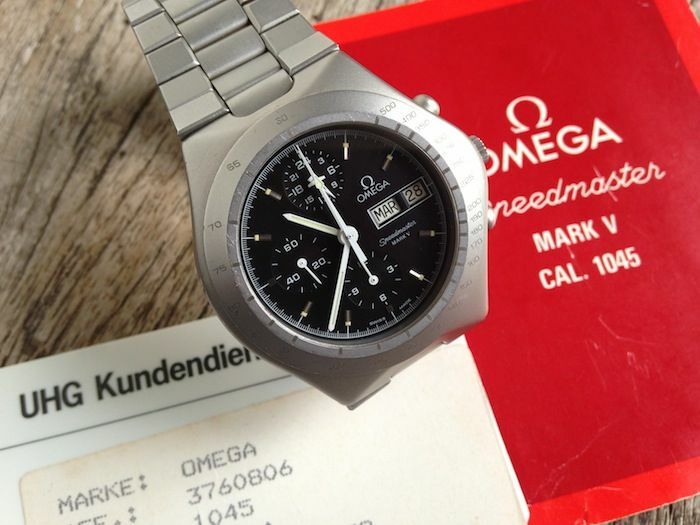 Chris L from Manila sent us some pictures of his Speedmaster Mark V, that is in his collection since 2006. A time piece that is hard to get (there is currently only 1 for sale on Chrono24) for Speedmaster enthusiasts. Although most of the Mark series are very well documented on the legendary Chuck Maddox website, we’ll try to provide you some extra information. The Speedmaster Mark V was based on a design that OMEGA already introduced in 1982, a reference 345.0803 Speedmaster that was solely intended for the (West-)German market. OMEGA refers to this Speedmaster as the ‘Smooth Line’ Speedmaster collection. It also has been used later on in the Speedmaster Moonphase 345.0810 that was produced in 1985 (only 700 pieces). It is a common misunderstanding that the Speedmaster Mark V was produced for the German market only, it was wider available than only in (West-)Germany. Also, The Mark V and some of the Mark III’s are the only non-Professional models in the Speedmaster Mark series. As you probably noticed, the dial lay-out doesn’t look like the standard caliber 861 chronograph lay-out. It is very similar to the Mark III, Mark IV and Mark 4.5 watches. The Mark 4.5 and Mark V watches have a different movement from the Mark III and IV though. The Mark 4.5 and Mark V have the caliber 1045 movement, which is based on the Lemania 5100 movement. A movement of which the production ceased a few years ago (although a brand like Tutima sourced enough of them to deliver Lemania 5100 based watches up till last year). The Mark III and Mark IV (and Speedmaster 125) use its brother, the Lemania 1342 based movement. 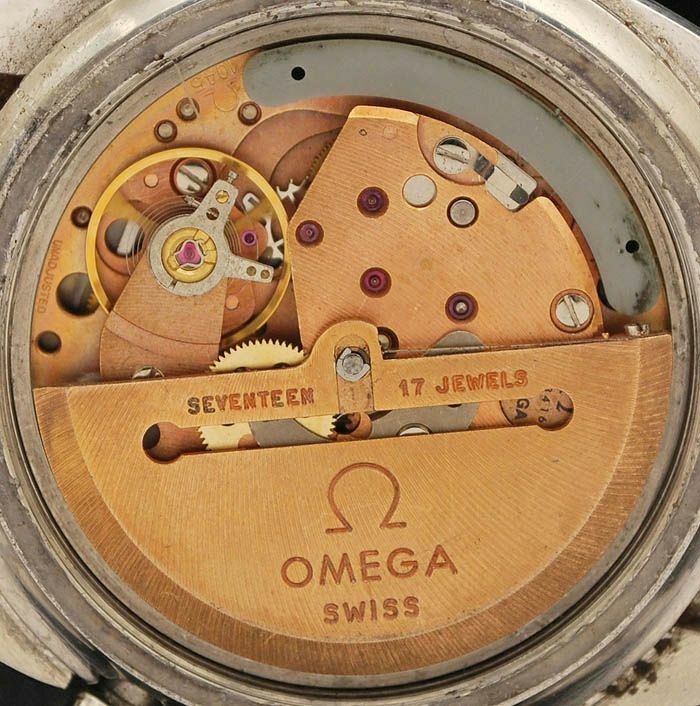 The OMEGA Caliber 1045 was also used in the Speedmaster that is being considered the ‘Holy Grail’ Speedmaster, the reference ST376.0822 (which we discussed here). The Lemania 5100 is a popular chronograph movement by those who love tool watches. Watches with a military look & feel or at least a watch where functionality dictates instead of design. Purists of movements might not like the Lemania 5100 as it uses plastic or nylon parts. It isn’t exactly an aesthetic beauty, but people respect the Lemania 5100 for being a solid work horse. Much like the Valjoux 7750 basically is (but most of the time with an optical finish which is nicer than the Lemania 5100). Although the demand for the Speedmaster Professional or pre-Professional (any reference number) is much higher than the demand for these Mark-series, the Mark V is one that – if you run across one – you definitely should consider if you’re a Speedmaster collector or enthusiast. The Mark II (ref.145.014) is the most queried Speedmaster Mark watch though (source: Chronolytics.ch). Perhaps also because it is the most common and well-known one. The ‘Smooth Line’ Speedmaster Mark V (or the 1982 model with caliber 861 or the later Moonphase model) really mark the 1980s with regards to design. The 1980s is a decade that isn’t particularly known for its tasteful designed objects, including a number of OMEGA watches that they probably don’t want to be reminded of too much. I think this Mark V is an exception to that (as well as some other models they released in the 1980s, like the Constellation Manhattan or the holy grail Speedmaster), especially because of the Lemania 5100 movement and dial lay-out. A big thank you to Chris L who submitted his wonderful Speedy Mark V. Soon, you will find a few other watches of his Speedmaster collection featured here as well. If you want to submit a Speedmaster for Speedy Tuesday, please send a mail to speedmaster @ fratellowatches . com (remove the spaces).